Root rot problems in hydrangeas are reason for worry as pathogens can cause severe damage to your plant. Identify the different types of fungi that attack hydrangeas, symptoms, the severity of potential damage and disease management for successful growth of healthy plants. Keeping your hydrangea vigorous through proper maintenance is key to resisting root-rot infection. Hydrangeas suffer from diseases most often when in decline, stressed or improperly cared for. Follow appropriate care requirements to raise strong plants capable of fighting off infection. Grow hydrangeas in morning sun and shaded afternoons; morning sun helps dry remaining moisture on plants, like dew, which is a breeding ground for fungi that cause root rot. Plant in well-drained soil, high in organic content, according to the Clemson University Extension. Avoid dry climates and drought conditions as well as high temperatures that may injure hydrangea plants. This type of root rot is caused by the fungus called Phytophthora nicotiana. Phytophthora root rot is most common among container hydrangeas, but may affect any hydrangea plant. Fungi survive in soil and plant parts and grow in excessively wet or dry sites. Symptoms include quick onset of wilting and the yellowing of all parts of hydrangea foliage, stunted growth and early leaf drop. The base of the stem may become a brown color due to the rotting of the root system, according to the Alabama Cooperative Extension System. Mushroom root rot of hydrangeas is caused by the fungi Armillaria mellea or A. tabescens. These fungal pathogens are soil-borne and aggressively attack hydrangea roots, particularly during extremely dry periods, according to the Alabama Cooperative Extension System. This fungi invades through wounds but may also simply attack root systems. Symptoms include wilting of shoots, plant death, the presence of white fungus under the soil surface as well as black fungal bodies that grow on roots and beneath bark. Within the drip zone and on roots, up to 100 honey-hued mushrooms develop in the end of the autumn season after significant rainfall. For phytophthora root rot, natural control includes keeping plants in separate containers so plants receive appropriate water amounts; overwatering and underwatering may enhance potential for disease growth. Choose disease-free plants and soil and sanitize containers before use. Prevent standing water with well-drained soil and containers; cover nursery beds using black plastic as well as gravel, according to the Alabama Cooperative Extension System. For mushroom root rot, choose sites untouched by this rot and adhere to special watering during summer drought. 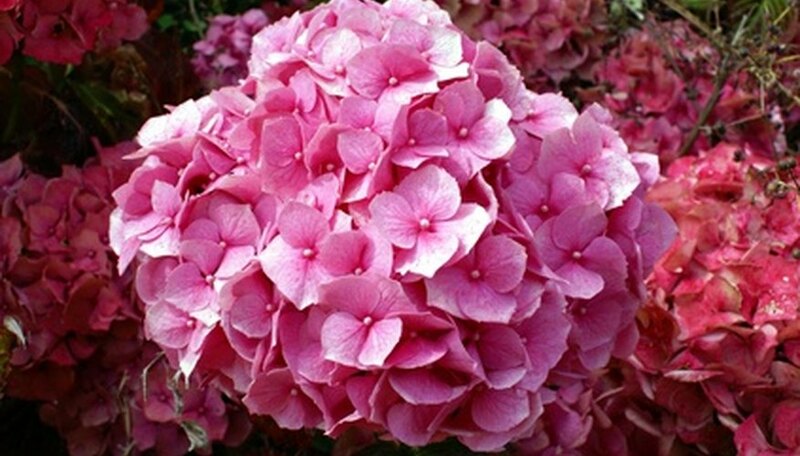 Provide established hydrangeas with deep watering in intervals of four to seven days during dry spells. For mushroom root rot, do not attempt to use chemical control methods as there is no fungicidal control treatment for this type of root rot in hydrangeas; remove and destroy the plant. For phytophthora root rot, use a fungicide treatment plan as a preventive method. Use a fungicide with one of the active ingredients: fosetyl-Al, propamocarb or thiophanate-methyl + etridiazole. These fungicides are used to spray or drench plants during transplant. Follow label directions, as some may need a one-time application while others may need repeat monthly applications, according to the Alabama Cooperative Extension System.